Social media marketing is a moving target. Just when you get something done, they change the rules. 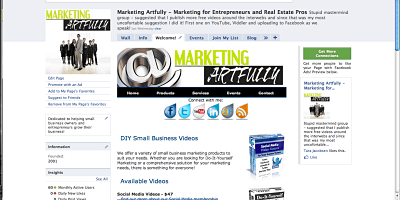 This time Facebook has changed the size of the area you have to use on your custom business pages! This update is not news to those of us who follow this kind of thing. Facebook has been talking about this since the spring and now it is officially going to launch as of August 23. By using an HTML-like website code, FBML (Facebook Markup Language), you can make a website-like page that you can direct new viewers to on the first visit to your business page (like the Marketing Artfully page to the left). After they “Like” your page they see the Wall instead of your custom page. You set this page by going to “edit page” and then selecting your custom page tab. 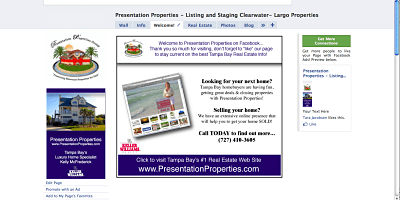 Having a custom landing page allows you put links on your Welcome Page, or to have a great graphic looking page that drives people right to your main website hub like Largo Home Staging Pro, Kelly McFrederick’s landing page. If you are already her Fan, check out the “Welcome!” tab. Here is the official word from Facebook, “To make your Page easier to browse, weâ€™re simplifying a couple things: 1. Boxes are going away (including the Boxes tab); 2. All custom tabs will be narrower (520 pixels). Read full announcement from Facebook.